Vintage Fashions in Fuji City! Another week and another magnificent weekend in Japan. I spent my Saturday night in Fuji City and had a great time at the Land of Oz and Leah's Apartment with some friends. 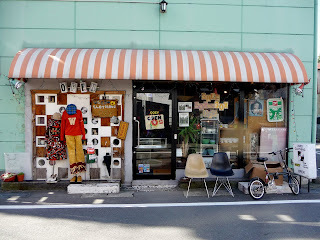 Today was a beautiful day and as we went for our morning Mosburger breakfast we stopped by a vintage store called Cozy Used Clothing Shop that Leah has been ra ving about! Turns out the owner has been to Vancouver and Toronto! Not only that, but he loves Value Village! 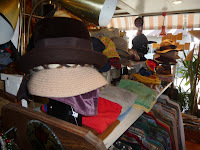 The store is really great and features all sorts of vintage treasures including: doc martens, vintage sunglasses, dresses, coats and bangles. The store has been open for three years and is an absolute gem! 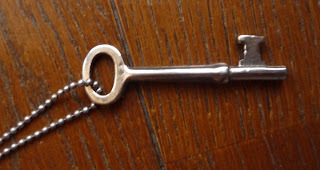 I first noticed this magnificent old fashioned key in the cabinet at the front of the store. It had no chain with it and I didn't bring a silver o ne with me to Japan. The owner managed to find a cool chain for me though and I was sold at 1,400 yen which is about ten to twelve dollars depending on your currency. It's a great find and really unique and I have never owned anything like it. Over a greasy burger at Mosburger, Leah insisted that I put it on with my gold necklace that I was wearing. I had never thought of pa iring gold and silver together. The necklace I was wearing was the one that I bought at Hanjiro. It is a bunch of fake coins of mutliple metal colors bunched together with a cute fabric bow. The two necklaces actually look kind of cute together. What's your take on silver and gold? The store owner has really great English! He also has a great website (see link above). 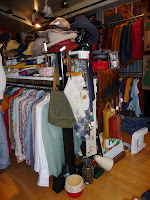 I have often visited great vintage and second hand b outiques that do not have websites. Nowadays the internet is becoming an important tool for getting the word out about your talent. Bloggers who visit stores can link to them and help to provide international coverage. You can also send bloggers your store website and ask them to feature your store! 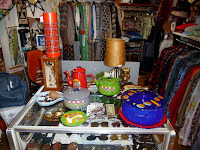 We love supporting the stores we frequent :) What is your favorite vintage store that you visited on a trip? In other news, next weekend we are going to an International Festival in Fuji! It is sure to be full of excitement and fun vendors. I also to ok a bunch of pictures on my adventure to Yokohama but haven't had a chance to post them. Will do it soon. Tokyo Fashion Week is rapidly approaching, along with all of the other fashion weeks and the Oscars! I just saw Benjamin Button this weekend and I have to say that it was fabulous! What did you think? My first movie experience in Japan was something else, that's for sure. There is designated seating and it costs 1,800 yen for a regular admission ticket. Wow! I just finished reading The Great Gatsby and I am reading Tender is the Night by F. Scott Fitzgerald. I am becoming a huge fan. Next on my list is Benjamin Button. I am so greatful to have a marvelous library here in Numazu because books are expensive! Everything is actually really expensive in Japan! There is definitely no sign of a recession, at least as far as I can tell. People are shopping like crazy here and everyone looks fabulous! What are you reading right now?! The Outside of the Store! The beautiful key necklace I bought! What do you think? well hello there, you busy little bumble bee! i absolutely adore your post & adore you more. im so glad you loved the store in fuji...& that we explored it! i love your key necklace & love you even more! I use to keys from my antique writer's desk as charms for a necklace. Have you guys tried Freshness Burger yet? Trust me, delish. Yeah, the key neacklace is cool! it would match on almost everything you can wear...smart choice! Really lovely! I love buying things on holidays! 1) I'm fine with silver and gold together, but for some reason I always have to match the metals in my earrings and necklace. 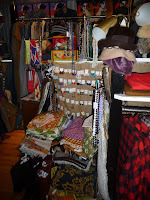 2) Fave vintage store would have to be Allan & Suzi on the Upper West Side of NYC. 3) Rereading my Harry Potter books. That is the most perfect key chain i've ever seen. Cool buy! that vintage shop looks and sounds fantastic. I love that key necklace also, it's so unique! That store looks seriously amazing! im so jealous once again. that necklace is so cute, is it sterling silver? looks it. 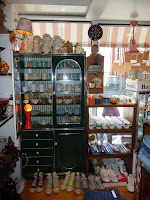 i love vintage as it is ... japanese vintage?! that's awesome. i need a chain for my skeleton key. yours looks lovely! this key neckalse is just awesome!love it! So fun! Love your new necklace! Great necklace- that store looks so adorable! 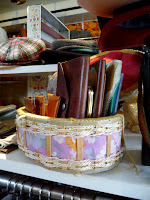 I;m sure vintage shoppping in Japan is like heaven. Hi! My name is Tatsuya from COZY. Do you remenber me?? 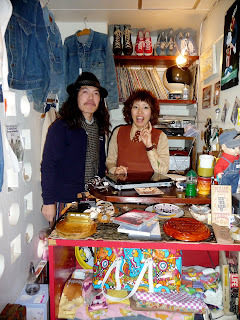 Thank you for you wrote blog about my shop. I'm really glad for that. Great to see you! But I'm going to study English more... Please come again!! Thank you!! The stores look amazing and the key necklace is perfectly you. I always thought gold and silver was taboo but I've seen many stylish people work it well. I, however, would look like a ten year old who'd fallen into her mother's jewelry box. What a CUTE store - love the name, the look and that necklace. Cozy indeed! Thanks for sharing all these! So lovely! I wish I can travel more! 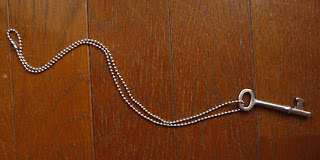 I LOVE the key necklace..makes a nice Vday gift ;) ....and who DOSNT love VV ? !